In the last post we used the persuasion diagram to organize advertiser information, which we then used to compose a radio ad. How much different will our content be for the newspaper? Surprisingly little. Using the sequence shown in the diagram, let’s put the pieces together. You’ll note that we’ve used the radio script, with a few additional touches, such as the additional local phone numbers, the internet address, and the MasterCard, Visa, and Amex logos. The use of some of the verbiage as headlines or subheads allows people to skim the ad to see if it has any interest to them. Just as we used radio sound effects, we injected photos of roaches in the newspaper ad to evoke emotion. So what is the difference between a radio ad and a newspaper ad? Very little, actually, and that’s a key point. With only minor modifications, this same message will work as a Yellow Pages ad or as a flyer. 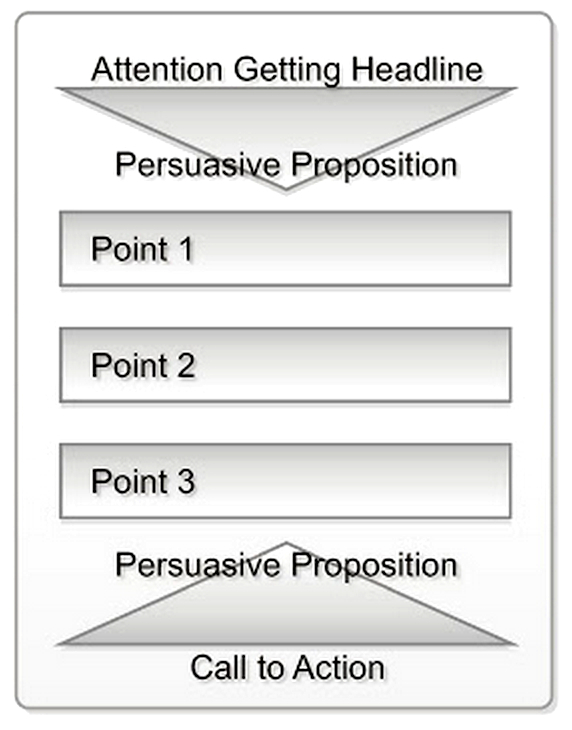 Try using the Persuasion Diagram for your next ads. I suspect you’ll be pleased with the results. Your first customers were your neighbors, your family, your friends. But they already bought. You have a lot of Facebook “likes,” but too few sales; a few dozen Twitter followers, but too few customers. You’re discovering the scariest part of entrepreneurship: recognizing that you need to advertise, but having no idea how much to spend inviting new prospects to come do business with you. Spend too little and no one is persuaded. Your cash slowly dribbles out as your company sinks into indifference and obscurity, leaving no mark, quickly forgotten. But spend too much and you burn through all of your operating cash in a glorious imploding fireball, leaving a crater where your company used to be. Briefly noted. Still quickly forgotten. But, when you find that very narrow sweet spot in which every dollar you invest in new customer acquisition flies off into the world, and returns with several of his friends, you have one of the most powerful tools available to small business. It can turn small companies into big companies The key is learning which of the five primary local marketing strategies applies to your unique circumstances, and applying the exact marketing spend to keep you flying higher and higher. How high you soar, how fast you get there is completely within your control. You’ll learn to maximize the return on your marketing investment whether your company manufactures, wholesales, retails, or provides services. Best of all, by creating this plan you’ll acquire a transferable skill which will help keep you in the black for the rest of your entrepreneurial life. PowerSOARINGTM poises you for the kind of sustainable growth that every owner dreams of, but shockingly few achieve. It helps every dollar to provide maximum impact. Can you afford anything less? The two largely ignored factors which will leverage your marketing investment, and predict whether you’ll have greater success with traditional mass media, direct response, or face-to-face direct sales. Some workshop attendees are astonished to learn they shouldn’t be spending any money on advertising. Which of the five local marketing strategies best applies to your firm, and how that choice will affect the timing of every advertising expenditure. This isn’t taught at most business schools, but it’s critical to successfully persuading prospects to consider buying from you. Why your location must, must, must be considered part of your marketing budget. Is there such a thing as a location so perfect that no advertising is necessary? How can you know for sure? What every duck hunter knows that many business owners don’t think applies to marketing. It’s so obvious you’ll never questions this decision again. When you should seek the services of an advertising agency or marketing consultant. How to choose an advisor that understands and accepts your goals and marketing strategies, and most importantly, how to manage that relationship. PowerSOARINGTM participants will have a full year’s access to our online Budgeting Tool. This tool automatically calculates the appropriate budget amount for each month of your marketing plan. (Some participants have told us access to the Budgeting Tool is worth the entire cost of this training.) You’ll leave with a plan of the caliber you would normally pay an agency thousands of dollars to create for you. This all-day, plain English budgeting and financial planning business course is only $295. The price includes all course materials, access to the Budgeting Tool, and our no excuses money back guarantee: if by our lunch break you haven’t already learned enough to justify the modest cost of the PowerSOARINGTM intensive workshop, simply turn in your course materials and we’ll refund the cost of admission. The San Diego PowerSOARINGTM Seminar is sold out. Based on the enthusiasm we’ve seen for this material, we’re planning a follow up seminar in first quarter of 2015. Click Here to stay informed. We’ll add you to our waiting list. Chuck McKay, has spent the better part of three and a half decades helping owners of small businesses and professional practices find the most effective ways of acquiring new customers. Chuck is the author of Fishing for Customers and Reeling Them In (now in its fifth printing) and The Net Effect – How to Pull in Netloads of New Retail Customers for FREE with Local Search Marketing. Along with 49 of America’s other top marketing experts contributed a chapter to Wylie and Sons Mastering the World of Marketing. Chuck has owned and operated radio stations and a weekly newspaper, and has been featured in the Washington Post, Jewelers Circular Keystone, and HQ Magazine. The concept is simple, but the answer isn’t, mainly because it costs less to attract shoppers who are physically close to your business than those farther away. It’s one of the topics we’ll be covering in detail at the PowerSOARING™ One Day Intensive Marketing Seminar coming to Hera Hub in San Diego. The easiest way to explain this may be with jam, and toast. Spread over half a slice it covers the bread with a thick, generous coating of strawberry goodness that’s evident with every bite. And if you wanted to spread our delicious strawberry jam over seven and a half slices of toast, well, the result will be disappointing every time. There’s just not enough jam for a satisfying coverage of that much toast. Whether you’re an esthetician, an attorney, or run a smoke shop; whether you weave custom rugs, or fit custom toupees, the concept works exactly the same way as jam on toast. Today, let’s consider an HVAC (heating and air) contractor in Rancho Cucamonga, California. Half a slice of toast in this case would equal all of the homes within half a mile of the shop – 2,132 households. One slice (one mile) includes 5,002 homes. At a two mile radius from the shop that number of households jumps to 20,268. At five miles the number of households has grown to 74,804. And within a 7.5 mile radius the household total has reached 146,585. How Do We Reach All Those Homes? We’re going to rely on one of the oldest forms of traditional media: direct mail. We’ll send a postcard to all of the homes around our shop promising heat when it’s cold, cool when it’s hot, and lightning fast emergency service. For illustration, let’s say our tablespoon of jam would let us deliver postcards to 150,000 homes. One tablespoon of jam spread across seven and a half slices of toast doesn’t provide any flavor. Worse yet, the jam arrived before the bread finished toasting. You see, most homeowners don’t think about hiring a heating and air contractor when their system is working. They don’t even think about heating or air until their system breaks down and, with a loud kerchunk, the toast pops up. If we send our mailing out in April we have to hope it arrives just as someone’s heating or air conditioning system fails. We also have to hope they become very uncomfortable very quickly. Because if they don’t have any issues until July they’ll never remember we offered jam when there was no toast. That tiny morsel of April sweetness was effectively gone before anyone bit into it. 5,002 postcards, one sent to every home within a mile of our business, will leave enough budget to print and send 144,998more cards. What do we do with them? Simple. We send them to the same 5,002 homes a couple of weeks later. And again ten days or so after that. In fact, our budget will permit us to reach those homes 30 times over the next 12 months. Those other households are simply too far away for cost-effective reach. We could try to reach 146,585 households once each. Mathematically, in a single contact, we’re likely to convince them only 3 percent of the way to picking up the phone and calling for help. When you understand how to send your marketing dollars out into the world, and have them bring several friends when they come back home, you get to decide your own growth rate. How high do you want your company to fly? How fast do you choose to get there? At the risk of sounding immodest, I do. I’m Chuck McKay. I’ve spent the better part of three and a half decades helping owners of small businesses and professional practices find the most effective ways of acquiring new customers. I’ve condensed all of that experience into a replicable system we call PowerSOARING™. You apply different variables to the system based on your own situation. It will become obvious that building a brand that customers think of when they need what you sell requires a different strategy than asking for that sale right now. You’ll learn to budget differently as a startup than when you’re at the top of your market. But regardless of your standing in that market, the PowerSOARING™ One Day Intensive Marketing Seminar teaches proven techniques for “right sizing” your company’s marketing budget. Right Sizing your budget helps every dollar to provide maximum impact. Can you afford anything less? This may be the best $295 investment of your professional career. Reserve your seat before midnight on November 1st to get an hour of free one-on-one coaching with me. Together we’ll fine tune the marketing plan you’ll create during the PowerSOARING™ Seminar. How much are we willing to pay for a non-material experience? Among the super rich it’s no longer enough to give a loved one a new Maserati GranTourismo (MSRP $110,000). Now, the proper gift is a private concert by the Rolling Stones (MSRP $4,000,000). Sociologist Melanie Howard suggests that, as people have more expendable income and more options, we are, as a society, hauling ourselves up Maslow’s hierarchy of needs toward the apex of self-actualization. My first thought was that this was a co-incidence, one of several other Chuck McKays which includes a high school English teacher, a medical doctor, and the disc jockey from CKLW. Then the disclaimer popped up to explain the hoax, and offered to help me perpetuate it on my friends. It’s the Personal Experience Factor. It’s exactly the topic my colleague, Mike Dandridge, speaks and writes about. It was through Mike that I first learned of the 1999 book, The Experience Economy, by B. Joseph Pine II and James H. Gilmore. He drew my attention to Pine’s and Gilmore’s observation that the price of coffee depends largely upon the way it’s delivered to the consumer. “Consider, however, a true commodity: the coffee bean. Companies that harvest coffee or trade it on the futures market receive — at the time of this writing — a little more than $1 a pound, which translates into one or two cents a cup. When a manufacturer grinds, packages, and sells those same beans in a grocery store, turning them into a good, the price to a consumer jumps to between 5 and 25 cents a cup (depending on brand and package size). Brew the ground beans in a run-of-the-mill diner, corner coffee shop, or bodega, and that service now sells for 50 cents to a dollar a cup. Highly profitable companies are those which sell those services as individual experiences. Those which sell at retail assume their “guests” will want to purchase mementos which remind them of a specific experience. Walt Disney Company has been the shining example of selling the experience since the opening of their first theme park in 1955. Progressive Corporation makes both the purchase of vehicle insurance, and the settling of claims an experience. Check out their web site to get a feel for the purchase, then imagine the effect their claims adjusters have on accident victims when they show up with a van designed to calm them. Refreshments, mobile phones, and someone to arrange to have your vehicle towed and repaired, perhaps even to set up overnight accomodation for you if necessary. Want to visit Apple’s stores in Great Britain? Use their “online concierge” to plan the trip. Apple sells much more than iPods and Macs. Apple now sells hospitality. In other words, an experience. Pizza Hut offers to host your child’s birthday party. In addition to feeding the birthday party, they provide birthday cake and other amusements. And this is perhaps the way to mass produce individual experiences. Treat the whole company as theatre. Treat the underlying goods and services as props. Can you do this with your customers? Can you stop focusing on delivering a less expensive widget, and instead deliver a memorable experience, of which the purchase of the widget is only one of the steps? Can you, like the practical joke nominating Chuck McKay for President, embed simple customizations into your presentation, and customize your experience for each shopper? Chuck McKay is a marketing consultant who helps customers discover you, and choose your business. Questions about creating individual customer experiences may be directed to ChuckMcKay@ChuckMcKayOnLine.com. The formula used to be simple. You advertised. People responded. They called. They came. They bought what you sold. I have the privilege of working with an exceptional group of marketers in the Wizard of Ads ® organization. Nearly five years ago the partners began talking to our clients about social changes that were beginning to effect the business landscape. Those changes are no longer predictions. They’re upon us. They’re a direct result of the Internet – but not for the reasons you may suspect. You see, value is created when there’s an information imbalance. Sometimes the inequity is obvious. If you had a medical doctor’s knowledge, for instance, you wouldn’t need to consult one. But sometimes the information spread is not as easily recognized. Successful retail merchants know where to buy at wholesale, how to ship, and how to competitively price in order to keep shoppers buying from them. Yes, their profit comes from buying low and selling higher, but it also comes from the retailer’s specialized knowledge – what to buy, how much to buy, how to price it. But the Internet places massive amounts of information just a few keystrokes away, and for free, which changes your entire relationship with your customers. They now dictate exactly how, and under what circumstances, they’re willing to do business with you. What can that retailer do? What’s the new strategy when the information that always delivered profit no longer provides a competitive advantage? Businesses that services rather than goods face the same issues. The consumer mindset has changed. Advertising which produced results since World War II isn’t working as it used to. Twice a year the Wizard of Ads ® partners from around the world * congregate to bring each other up to speed on our various areas of specialized knowledge. We’ve never before offered to share these insights with the general public. The Boom Your Business Seminar in Nashville, August 1 & 2 will provide 200 owners access to the most powerful business seminar ever offered to small business. Want to know How to Fight the Big Boys and Win? Mike Dandridge, author of the One Year Business Turnaround will tell you exactly how it’s done. Mike grew a small electrical supply company into a million dollar a month powerhouse in a small town while flanked by Lowe’s on one side and Home Depot on the other. Do you suspect you’re not effectively marketing to women? You’re probably right. Michelle Miller, author of The Natural Advantages of Women, and co-author of the new The Soccer Mom Myth will tell you exactly what to do, and how in The Motherlode: Hitting the Vein of Gold in Marketing to Women. If you instinctively know that customers need to discern a difference between your business and your competitors, Scott Fraser will show you how to apply the lessons of one of America’s strongest brands to the local level in Commodity Revolution; Differentiate Your Business at the Local Level. Clay Campbell‘s Get Big Results From Small Ad Dollars presentation will let you in on simple marketing techniques that are invisible to your competitors. They work especially well when you have more time than money. Clay is the author of How to Get Big Results From Your Small Ad Budget, and Leading the Above Average Life. Does your company have a web presence? International web expert Dave Young, author of Why We Blog, will show you how to make your site more persuasive, generate more leads, and increase your on-line revenue in Your Website: The Marketing Tool for the 21st Century. Then web strategist Paul Boomer will teach easily-implemented techniques to improve your customer’s on line experience in 10 Things You Can Do TODAY to Improve Your Website. Finally, web video producer extraordinaire, Rex Williams, will detail the keys to becoming personable, direct, and real to people you’ve never met in his Building Relationships On-Line presentation. Many small businesses constantly struggle to create an appropriate marketing budget. How much is enough? How much is too much to spend in advertising your business? In How to Calculate Your Ad Budget, Ray Seggern will not only make the budgeting process simple, he’ll share a secret on-line tool which does all of the calculations for you. (Ray will also show you how to buy word-of-mouth, and how to budget for that). Tom Waynek has spent years studying the signals radiated by both predators and their prey, and has distilled six key business truths in Signaling Theory: What Are You Really Saying to Your Customers? Tom will teach you how to make powerful marketing statements to increase store traffic, sales, and word-of-mouth. Do you suspect your ads could be better, but you’re not sure where to start? Take Ad Writing 101 from one of America’s top copywriters and writing teachers, Chris Maddock. You’ll be able to apply Chris’ techniques to advertising copy and to brochures and web sites. In Thinking Outside the Box, engineer-turned-poet Peter Nevland looks at those crazy little ideas that most of us dismiss as impossible, and shows how nearly every great businesses success starts as one. When you understand how to recognize and harness those ideas, you’ll also see the dangers of not implementing them. Marketing (and all other social trends) will make more sense after you’ve seen Michael Keesee‘s The Pendulum: Marketing in 2008 and Beyond. You’ll recognize the driving and predictable forces shaping society and make better decisions on communicating with the public after this multi-media presentation. As a regular reader of this blog, you’ve seen my P.A.I.N. series of posts. I’ll be explaining which messages work better on TV, which in newspaper, on radio, in outdoor, and in Yellow Pages in my presentation Marketing P.A.I.N. – Explode Your Advertising ROI Through More Effective Messaging. Sound like information your company could put to good use? Yeah, I think so, too. I hope you’ll make plans to join us. There are only 200 seats available, though, and word-of-mouth on this event has already sold roughly half. Don’t put off this decision or you’ll miss out. * Wizard of Ads has offices in Australia, Great Britain, Central America, Canada, and the U.S. I have an extra pair of tickets to the Boom Your Business Seminar. If you’re a business owner ready to take your company to the next level, drop me a note, and briefly tell me the issues you’re facing. I’ll give the tickets to whomever I think might get the most benefit from attending. Chuck McKay is a marketing consultant who helps customers discover you, and choose your business. Questions about the Boom Your Business Seminar or about the Wizard of Ads ® partners may be directed to ChuckMcKay@ChuckMcKayOnLine.com. I’m dating again. Oh, not because my marriage to the Lovely Mrs. McKay is in trouble, far from it. I’m “dating” in that I’m ready for a new consulting relationship. I’ll be taking my time to find the right fit for the long term. You see, marketing isn’t art. It’s not science. Its a series of decisions based on relevant case studies and historical examples. Those decisions may, or may not, predict results. So, truthfully, marketing is a gamble. A good relationship requires the client to understand, and accept, that the consultant’s function is risk management. A good consultant stacks the odds in the client’s favor by having a broad knowledge of proven marketing techniques. By knowing what has worked for other businesses. By seeing the parallels between the client’s issues and similar problems that other industries have solved. By recognizing not only the factors which can derail business, but also the opportunities that can help the client leapfrog over his competitors. Yeah, I’ve been called an “expert.” But don’t expect me, or any other consultant, to show up and give you the magic formula for endless wealth. Instead, expect me to be your business B.S. meter. You see, I love speaking and writing, but I have little respect for those speakers who have been talking for twenty years about the things they accomplished twenty-five years ago. I work with a select group of clients in order to stay current, and relevant, and focused on the real problems faced by businesspeople every day. As a speaker, it provides an edge that just can’t be faked. Some consultants look for opportunities to run the clock, and bill the client for more hours. Instead, I charge a flat fee, which changes each year at the same proportions as my client’s top-line revenue. This isn’t called a relationship by accident. When the client does well, so do I. When the client doesn’t, I don’t, either. And I don’t profit from the traditional 15 percent commission that the media pays to advertising agencies who place advertising for a client. Oh, the media still provides that commission, but my client pockets the cash. Some clients get back more in those commissions than the fees I charge, and thus actually make money by using my services. But, past the mechanics, the primary values any consultant provides are perspective, and advice, which brings us to the point of this writing. Sometimes the client doesn’t wish to follow that advice. A client I’ve been working with, however, will not use any club I recommend. As much as I’ve tried to help him get distance on his shots, he insists that I do things his way. It appears he’s hoping I can execute his marketing strategy better than he did. But, even a brilliant execution of a flawed strategy still leaves a flawed strategy. Since I don’t believe that our professional relationship is benefiting his business, I can’t in good conscience continue to charge him for my services. I hope we can stay friends, because I truly enjoy his company, but I have resigned the account. So now, I’m dating again. I’m looking for a new relationship. I’m meeting some new business owners for the first time, to see if there’s any chemistry, not for a quick project, but rather for the long-term. My most recent client and I have worked together for a year and a half, now. Others go back as much as eleven years. The best fit is likely to be a professional practice or owner-operated company, whose owner is ready to take that company to the next level. Do you know someone like this? Would you care to introduce us? Chuck McKay is a marketing consultant who helps customers discover you, and choose your business. Questions about marketing your business may be directed to ChuckMcKay@ChuckMcKayOnLine.com. Its hard to believe that a dozen years have gone by since Jeffrey F. Rayport of Harvard Business School coined the term Viral Marketing. A viral message replicates itself through voluntary participation of the recipients, spreading an idea through preexisting social networks, much like a pathological virus spreads through a population. The self-replicating part is what excites marketers. A popular video clip which is shared through the Internet or camera phones is known as viral video. Popular examples include the Evolution of the Dance or the Star Wars Kid (which has been viewed more than 900 million times). Imagine the possibilities. People circulating your video, for free? But, wait a minute. These videos have high entertainment value. Not too many carry any company’s advertising message. How does a company use viral video to promote its products? You do something, or say something, that makes people want to share the video clip with their friends. Blendtec is an appliance manufacturer. They make a pretty good food blender. How does one convince people to talk about kitchen appliances, and more importantly, to promote the Blendtec brand? You show the power of the blender. Blendtec spent an average of $50 each on their “Will it blend?” series of videos. Anyone could have blended food. Blendtec got attention by demonstrating their blender’s ability to turn anything into dust. Tom Dickson, Blendtec’s CEO, stars in all of the company’s videos. Google “Blendtec” to watch Tom (and his blender) pulverize such items as marbles, hockey pucks, and even crowbars. If that wasn’t outrageous enough, Tom successfully pushed his company’s awareness levels in the public consciousness over the top, by turning a $600 i-Phone into powder? Some viral strategies work better than others. Blendtec’s strategy is brilliant on two levels. First, the shear outrageousness of blending hockey pucks and crowbars is likely to get people to talk about the power of this blender – which focuses on the attributes the manufacturer wants you, the consumer, to remember. Blendtec‘s web site in the first ten days following this video’s release. Remember, getting noticed is only part of the equation. Being remembered for something which promotes attributes of what you’re selling is the other part. Chuck McKay is a marketing consultant who works with professional practices and owner operated businesses. Questions about producing viral video may be directed to ChuckMcKay@ChuckMcKayOnLine.com. Have you ever wondered what would happen if you put two experts on your favorite topic together and let them discuss the topic? Would you have Robert Allen and Carlton Sheets exploring nothing down techniques? Or would you prefer Milton Friedman and Steven D. Levitt hashing out the social repercussions of school vouchers? Me? I’d have Holly Buchanan and Michele Miller talk about marketing to women. Michele’s Wonderbranding and Holly’s Marketing to Women Online are required reading on the subject. They’ve been sharing the stage in speaking engagements for a couple of years. I’ve been looking forward to their co-authored book, The Soccer Mom Myth, for most of the last year. Its been worth the wait. Men and women communicate differently. No surprise there. But Buchanan and Miller note that there are times when one gender’s communication style is actually more effective with all customers. (Think men’s instructions and naming preferences with women’s categorization and navigation). By picking and choosing between gender specific tendencies, both genders will have a better shopping experience. And thats a critical point The Soccer Mom Myth makes: improving the purchasing experience for women automatically makes the experience better for men, as well. There are companies who are thinking they should market to women. This book will help them make giant strides in that direction. Other companies recognize that the phrase “marketing to women” is already redundant. They simply call what they do “marketing.” The Soccer Mom Myth will help them refine their technique and establish a major head start over their competitors. The Soccer Mom Myth, $19.95, 232 page hardcover, ships March 10. This book should be a part of every marketer’s library. Chuck McKay is a marketing consultant who works with professional practices and owner operated businesses. Questions about marketing to women may be directed to ChuckMcKay@ChuckMcKayOnLine.com.